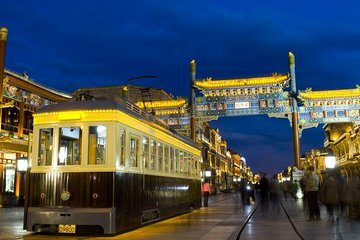 Se Beijing komme til liv om natten på denne 3-timers private spasertur i byens must-see attraksjoner. Reise med din private guide og din gruppe på opptil 15 personer etter mørkets å se landemerker som Nationalteateret og Himmelska torget lyser opp. Lær om hvert nettsted fra guiden din mens du går for å få insider kunnskap om byens toppattraksjoner. Møt din guide i lobbyen på hotellet ditt i Beijings tredje ring klokka 18.00. Med din guide og din private, små gruppe på opptil 15 personer, gå til Qianmen St., en av de travleste gatene i Beijing under Ming og Qing-dynastiene og et varig lokalt ikon. Fortsett deretter til Tiananmen-torget, kjent for sin historie, samt status som en av de største sivile torgene i verden. Lær om Tiananmen Square fra deg før du fortsetter til National Theatre, hvis glass og titan kuppel lyser om natten, og skaper et vakkert syn. Fullfør turen på det livlige Wangfujing St., kjent for sitt utvalg av butikker og restauranter. Prøve lokal gatemat og utforsk butikkene alene, og la din guide vise deg til et godt sted å nyte resten av kvelden din, eller hjelpe deg å ringe en drosje tilbake til hotellet (egen regning). The two main street locations on this tour were too touristy and pretty much a waste of time. The square was nice and beautiful at night and my tour guide was ok and all, but he really didn't offer much conversation about the area or history. It basically just felt like he was there to walk around with and that was it. My other tour guides were much much better. We were staying in Wangfujing Street, so therefore if I knew how easy it was to get to Tianammen Square, we probably would of miss this tour. Although we are intrepid travellers who like to work things out, so if you could not be brothered do the tour. The tour goes through the most amazing food on the planet, we ate pigeon, although the scorpions, grubs and whatever those other things were did not appeal to me to eat. It was pouring rain which did not help, although it was still pleasant walking in the warm rain. We did visit interesting shops at the end of the tour as well. Our guide was really good making sure she caught the bus with us and made sure we knew how to get back to our hotel, very caring girl indeed. Viator tours are always spot on anywhere in the world, I just love this company and have great faith in what they put together tour wise. This tour was amazing! Becky helped schedule us just right to see the retiring of the flag in Tian'anmen square. She was sensitive to our group needs and when some of our older group members struggled with the walking, she helped us travel back via bus rather than on foot. She was knowledgable, prompt, clear, and guided us in perfect English. She answered student questions respectfully, and seeing this part of the city was so fun. I'm not all for the new shops at Qianmen, but it was a delightful place to visit at the south gate of the square. Ending at Wangfujing was a delight.